PASSEGGIATA CORTA AL FAMOSO SIESTA WHITE SAND BEACH & VILLAGGIO ISOLA DI QUAINT. Vieni a soggiornare in una delle case più belle di Sarasota. The Lily Patch è un bungalow tipicamente floridiano, nel cuore di Siesta Key ed è stato pubblicato su Sarasota Magazine Living In Paradise, numero di ottobre 2009, come una delle "nostre città 10 case più belle". Situato su un grande angolo appartato in un tranquillo quartiere residenziale, una breve passeggiata facile porta alla spiaggia di sabbia bianca o al villaggio; se ti senti più avventuroso, perché non pedalare intorno all'isola con le biciclette fornite? Il fascino della patch Lily è catturato con pavimenti in legno originali magnificamente restaurati in tutto e con 2 camere da letto e 2 bagni questo accogliente bungalow di cipresso pecky ha ampio spazio per 4 persone. Quando sei pronto per cenare all'aperto, perché non uscire attraverso le porte francesi nel tuo lanai privato dove puoi goderti di essere circondato da lussureggianti giardini tropicali ... La tua vacanza invernale perfetta ti aspetta. Siesta Key, Sarasota, in Florida, si trova nel Golfo del Messico. Vola in Tampa e guidare un po 'più di un'ora a sud sulla I-75 per uscire 205, o volare in Sarasota e taxi o noleggiare una macchina e in quindici minuti che sei qui! E, non dimenticare il bellissimo centro di Sarasota e il lungomare è appena oltre il ponte. E 'solo un breve tragitto in auto per un'esperienza unica culturale dal Ringling Museum, più teatri, il balletto, orchestra, opera, splendidi Selby Gardens, e ristoranti e negozi senza fine. * Lily Patch è dotata di lavatrice e asciugatrice ed è completamente chiavi in ​​mano. * Sicuramente NO SMOKING - NESSUN ECCEZIONI. * Le tariffe sono soggette al 12% di tasse di noleggio locale. * solo affitti mensili minimi. * Deposito cauzionale $ 1000 richiesto su tutti i noleggi. * Le utenze e la pulizia finale saranno detratte dal deposito cauzionale. Entrambi i bagni hanno una vanità per lo stoccaggio. C'è una doccia esterna anche per la doccia sotto il sole, particolarmente bello dopo una giornata in spiaggia. January and February living in The Lilly Pad was delightful and the neighborhood was fun and friendly. If you are bringing your dog, you will experience a wonderful group of dog walkers to join most any time of the day. The convenience of Palm Island will keep you close to the village to eat or shop or just walk around to people watch. So many more good restaurants are there as well as the local attractions and the waterside of the marina. We always reserve a day or a sunset to charter a sail from any number of charters in the marina. You will see dolphin for sure. Rich and Ali Light are very close by and go the extra mile to keep you happy and comfortable. and are looking forward to seeing you again. I have been lucky enought to stay here for the past five years for two months each year. Perfect place to relax. Two blocks from the beach. Owners are lovely and nearby if neaded. Lovely porch to relax on. Clean and very happy place. Lots of great restaurants nearby. My daughters also love this place. Nice quite area but if you want activity the village is within walking distant. Lots of friendly happy people. Ali and Rich are the best. for the last five years, and having you treat the cottage as it was your own. We hope to have you as our guests for many more years. We had a very nice time. The owner lives nearby and was most helpful and welcoming. We hope to stay there again. Sleeps 4.
and hope to see you again in November/ December. I had a very relaxing enjoyable vacation at the Lilly Patch with the greatest people in the greatest village by the greatest beach in the greatest neighborhood. Ali and Rich and the Lilly Patch were a real joy. Comfortable, clean house and they were there for anything I needed including borrowing paper for my computor. They are great host. So open and sharing and they make you feel very comfortable. I felt like I was living in a garden as I sat on the lovely brick porch. Love the out door shower. I am looking forward to coming back next year. Thank you so much for taking the time to write a review for us. We really appreciate it. See you next year! This is a review of "Lily Patch," a charming bungalow where my family and I spent the month of October 2013. 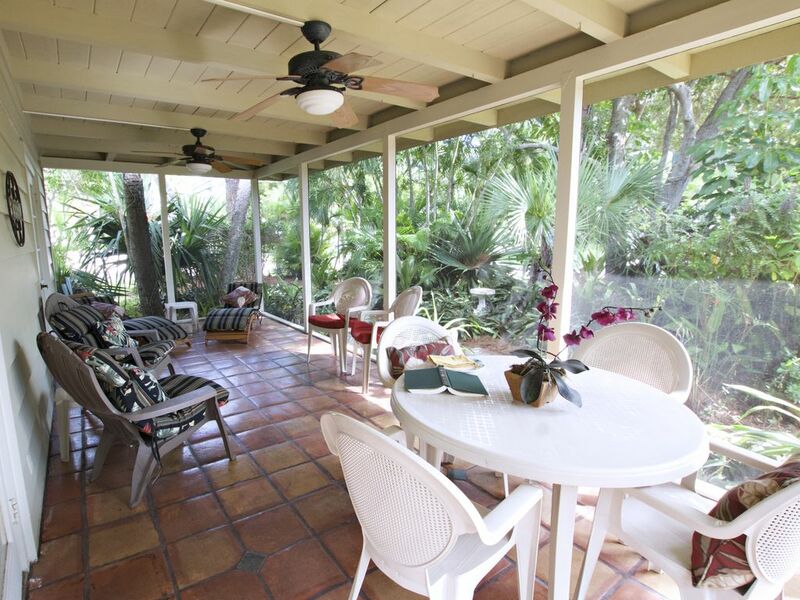 The vintage cypress-wood Florida bungalow has been beautifully maintained inside and out. It is located on a large corner lot in a quiet residential neighborhood just a short walk from the white sands of Siesta Beach, or from the shops and dining of Siesta Key village. The outstanding feature of "Lily Patch" is the large screened lanai which runs along one side of the house and is accessed by double French doors from the interior. We spent much of our time here, enjoying the lovely lawn plantings and the song of mockingbirds and doves. The rooms in the bungalow are spacious and the furniture is comfortable. The central air conditioning works really well, and each room has a ceiling fan. An outside shower is useful for washing off beach sand after a swim. The large kitchen is well equipped with all necessary appliances. All in all, we consider "Lily Patch" a gem of a property in a special place, and we definitely will return. What can I say! Incredible Cottage! Location is perfect. A short 2 block walk to the most beautiful location on the most beautiful beach in the US of A!!!!! Access. The Blue Lagoon is accurately portrayed in the pictures posted and is very clean and well maintained. The layout is open and very cozy! What they say down here very 'Old Florida' charm. Close enough to walk/bike to Siesta Key Village with lots of great restaurants. Eat Here and Flavio's being my favorites in the village for dinner and the Sun Garden cafe a must for breakfast. Very peaceful and quiet location. Luv sitting on the screen porch and reading w/ a glass of wine! Rich and Ali are great hosts with a plethora of local knowledge regarding everything fun to do in the area. A+ and you won't be disappointed! My pup Hogan loves the porch too and walking the neighborhood. Great dog beach in nearby Venice or Bird Key in Sarasota.